These colorful safety posters can be displayed in a prominent place in your plant to keep employees aware of the need to work safely. Buy several and change them periodically. Posters are 18" x 24" and are laminated on both sides with sealed edges so they can be easily cleaned if they get dirty. 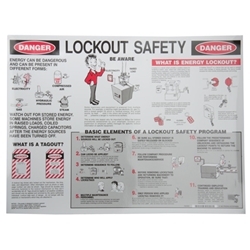 Promoting safety in the work place must be a continuing effort and these posters can be used over and over for years.